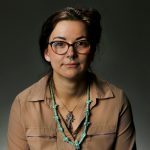 Journalists want to make sure their stories get out to the biggest number of online readers possible. After producing quality articles, landing pages, videos, images, graphics, interactives, podcasts and more, the question becomes: How do you cut through the noise and find engaged readers? Search – through Google or another search engine – is one of the classic referrers of web traffic to a news website. If you want to harness the power of the search audience and Google News SEO (search engine optimization), getting to know the terminology is helpful. Our examples in this post will be in the U.S. version of Google News. Most countries have the Google News feature. To appear in any of the Google News ranking types, you must submit your website through the form here. Your articles and other pages need to be indexed by Google, and then rank well to get on page one of the search engine results pages (or SERPs) for a given keyword. They can rank under the “All” and “News” tabs on the SERP. An example of the News tab for the keyword “OJ Simpson” is below. 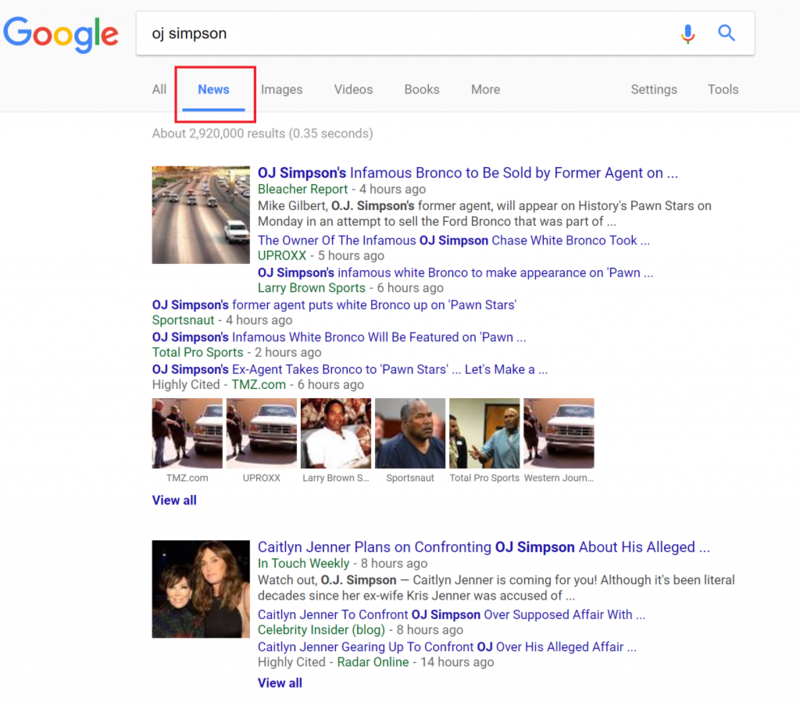 News results can appear in a few places within Google, including the News tab on the SERP. And of course they can rank on Google News, which has desktop and mobile – below is the desktop version. 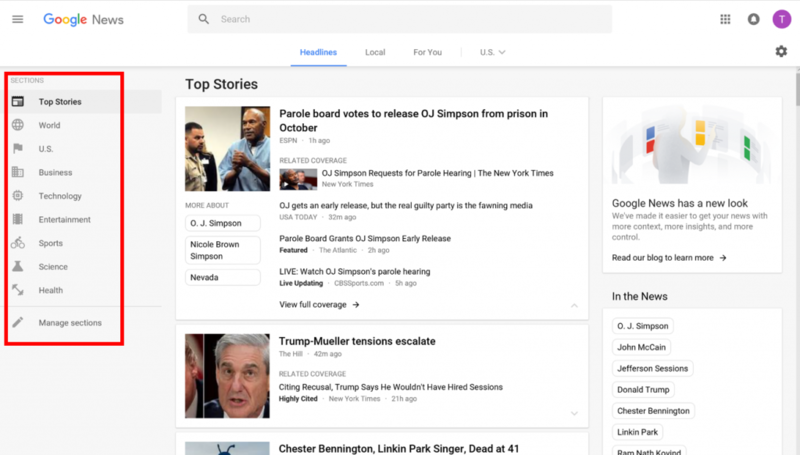 The desktop version of Google News has the Categories of all the keywords and stories that rank as news on the left side. The Categories are highlighted with a red box above. They are the buckets Google puts trending keywords and, the articles that rank for those keywords. Top Stories, unlike the other true categories (World, U.S., Business, Technology, Entertainment, Sports, Science and Health) is a collection of top articles from the rest. A quick way to double-check if a website ranks in Google News: Go to news.google.com, paste in the URL and hit search. If you get results from that website, it is indexed as News. Again highlighted with the red box, Related are keywords suggested by Google within the Category you’re looking at. Within each of the Google News Categories, there are Related keywords, which are the stories and keywords ranking within those Categories. So, if you switched the category you’re looking at from World to Health, the Related box would change to keywords ranking under Health. 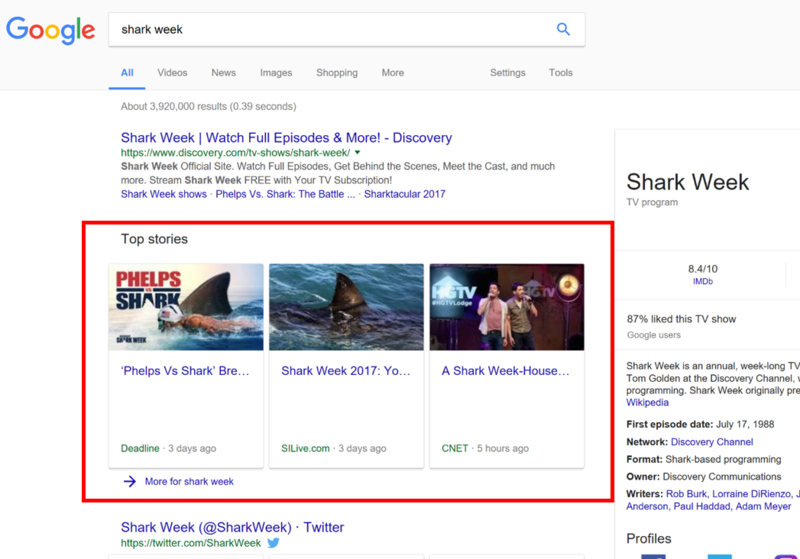 If you choose one of the keywords (or topics) under Related in desktop Google News, it will open a new page showing stories just about that keyword. If you select one of the Related keywords from above, you’ll see a page like that one above, which gives you Google News results for specifically that keyword. In desktop SERPs, Google News Boxes (also called OneBoxes) are mostly made up of a set of three articles with photos. When Google determines that a keyword has enough news coverage, it will open certain ranking types that are fed by Google News. 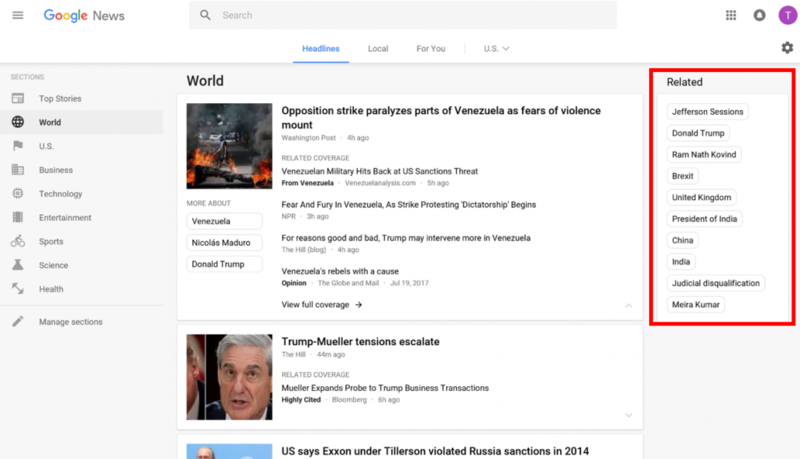 The main type is the Google News Box, also called a OneBox. They appear in both desktop and mobile SERPs. In desktop, a News Box is most often three articles with a photo, headline, publisher name and “last updated” date. They can also be just text links, and they can have fewer than three stories. There is also a link titled “More for (keyword)”, which will open a new SERP showing just Google News results for the keyword you have searched. Another way to narrow your search results to just news about the keyword is to click the News tab after you’ve searched your keyword. 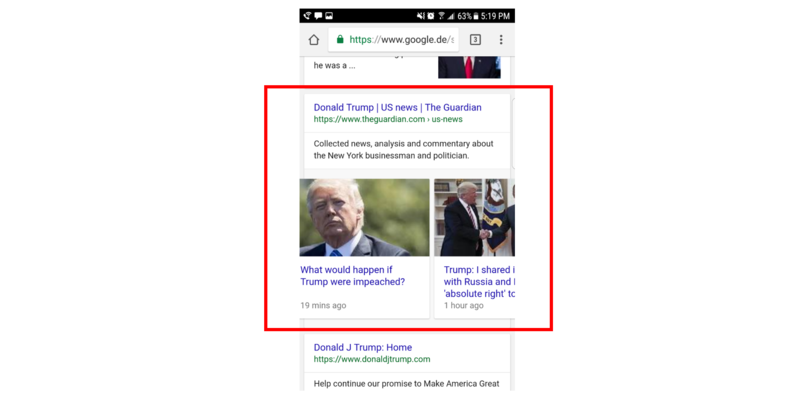 In mobile, the Google News Box in the SERPs can feature both text links and a News Carousel, just text links or just a carousel. When we switch over to the mobile Google News Box, it’s a bit of a different story. Unlike the desktop version, the mobile News Box usually contains one or more text links above the carousel. The carousel itself in mobile usually goes up to 10 spaces (swiping horizontally), instead of just three. And the carousels fall into two categories: all non-AMP articles or all AMP articles. AMP stands for Accelerated Mobile Pages, and is an article configuration Google says that it favors in its results. News Dashboard research has shown that over 80 percent of News Carousels in Google’s U.S. version are AMP-only. “Twitter tweet,” as we at the News Dashboard have named this Google News feature, consists of a short carousel of tweets that relate to a topic. One of the Google News ranking types is Twitter tweet, which collects what Google determines are the most relevant tweets around a keyword. 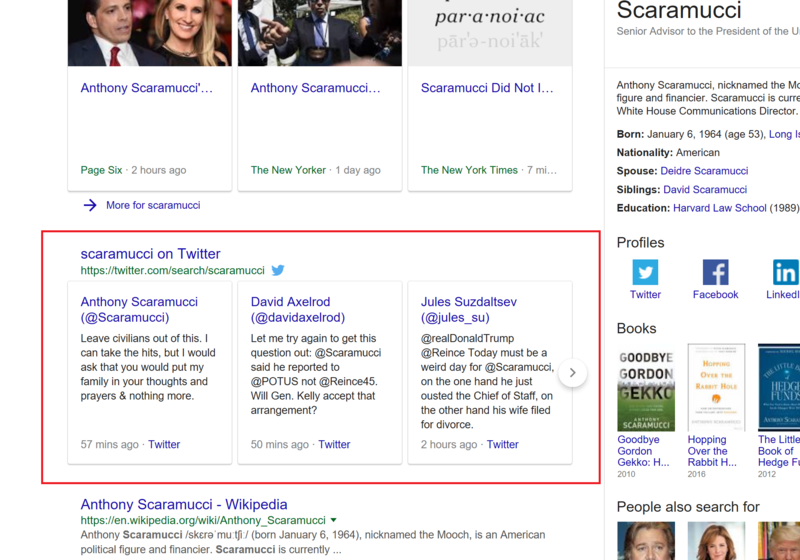 The above example is from desktop and a search of “Scaramucci” – about President Donald Trump’s short-tenured White House communications director. 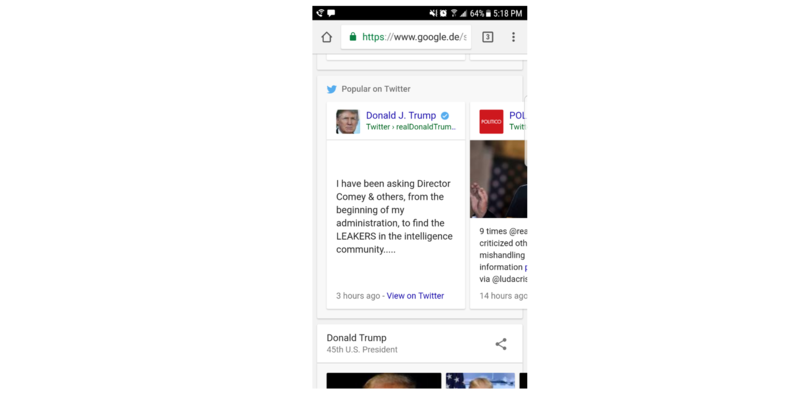 The “Twitter tweet” news ranking type in a Google SERP can often include tweets from the accounts of politicians, celebrities and brands. As with the News Box, there are Twitter tweet carousels in both desktop and mobile. They look basically the same on both versions, with the ability to scroll or swipe for more tweets. These ranking types contain articles from only one publisher at a time about a given keyword. Publisher Carousels are most common for sports keywords, but are popping up more and more in other arenas. A publisher needs multiple articles that rank for a given keyword to trigger a Publisher Carousel. If you’re ready to dive deeper, here’s a thorough list of many organic and paid SEO terms from Moz. And, if you do SEO for a news website or work for one and would like to increase your Google search visibility, sign up for a demo from News Dashboard using the pink “Request demo” box on the top right.